You now have access to a new online resource through WCCLS - Little Pim. 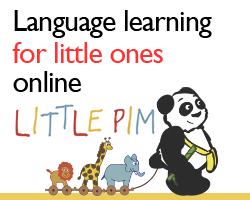 Little Pim is an online language learning system designed for kids aged birth to six. Early language learning has been shown to enhance verbal development, as well as reading, writing and social skills. Little Pim introduces children to a foreign language in a way they can understand at even the youngest ages. Kids don't even have to know how to read to learn with Little Pim! Lessons incorporate words and activities that are relevant to the child’s daily life, making the content more fun and usable from the get-go. Themes include mealtime, naptime and playtime. There are 10 languages offered through Little Pim, from Arabic to Russian. Access Little Pim via the WCCLS website - you just need your library card to log in! We also offer online language learning for adults with Mango Languages.